Travel up Main Street USA in style aboard a variety of colourful vehicles. 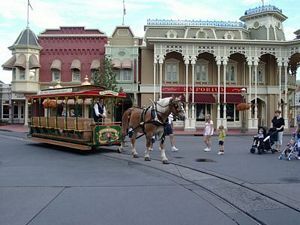 Horse drawn trams, carriages, jitney's or vintage fire-engines all make the one way trip from Town Square up to the central plaza in front of Cinderella's Castle or vice-versa. Best time to visit: Anytime. Vehicles don't operate during parades or firework showtimes. Lines for vehicles are fairly random as there's no real queue area to wait at. Stops are found nearby Town Hall and at the kerbside in front of Cinderella's Castle. Unless its something you want to try or are walking by as one's loading up, its probably not worth your wait. An omnibus used to operate along this route too until it was re-located to Epcot to be used as the character greeting bus you'll see during the park opening ceremony and around World Showcase. The Main St Vehicles have been traveling up and down this route since park opening 1971. The horses that pull the cars are between six and 10 years old, weigh at least a ton each, and work three to four days per week. The jitney cannot accommodate a folding wheelchair.